Learn more about sacrococcygeal teratoma, it’s causes and what can be done to help those who suffer. As mentioned, SCTs occur in approximately 1 in every 35,000 live births in the United States and are more common in females than in males. Approximately 60% of all SCTs are diagnosed by ultrasound prior to birth. In some cases, the tumor is so small that it goes undetected until delivery. If a SCT is detected, a targeted ultrasound will be performed to detect any associated abnormalities and a series of ultrasounds will be performed throughout pregnancy to monitor the size and growth of the SCT and to check for complications. A series of fetal echocardiograms (specialized ultrasounds of the fetal heart) may be recommended to closely monitor the fetal heart and check for early signs of heart failure. Almost all cases of sacrococcygeal teratoma do not require fetal treatment and most pregnancies will continue for the full duration with only close monitoring. However, if the SCT grows to be very large or if the fetus shows signs of heart failure, fetal intervention to remove the tumor may be necessary. Are there special considerations for delivery for a baby with sacrococcygeal teratoma? 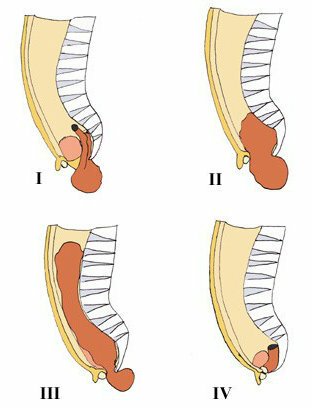 Type of delivery – A cesarean delivery may be recommended for large SCTs. A delivery plan should be carefully developed by your team of physicians and will be discussed with you and your obstetrician. Place of delivery – The baby should be delivered at a hospital that is well prepared to handle the intensive care and surgery required of infants with an SCT. There should be a neonatal intensive care unit with the capability to provide specialized care and pediatric surgery services. Time of delivery – Unless intervention is necessary because of fetal heart failure, there is usually no reason to intentionally induce early delivery. Large SCTs have been linked to preterm labor, and your physicians at the Center will discuss this possibility with you. Immediately following delivery, doctors will carefully evaluate your baby. In most cases, there is no immediate danger to the infant. Parents and family should be able to see and hold the newborn before transfer to the neonatal intensive care unit. The baby will be stabilized in a neonatal intensive care unit and your pediatric surgeon will evaluate the baby. Occasionally, the newborn may need help with breathing and blood pressure. Once the baby has stabilized for a period of time, special x-rays may be required to determine the full extent of the SCT. Although it may seem like most of the tumor has grown on the outside of the baby, a portion of the SCT can grow internally. Surgery will be performed to remove the SCT. The complexity and risks associated with the surgery depend on the size and location of the tumor. Smaller, external tumors are easier to remove than larger tumors. Depending on the surgical outcomes, the baby may need to stay in the hospital for days or possibly weeks before going home. The long-term prognosis of babies born with an sacrococcygeal teratoma is excellent and most will go on to live normal lives. Most tumors are benign and only require careful monitoring after removal. It is important to monitor the child for signs that another tumor is developing, as recurrence is fairly common in the first few years of life. Some SCT’s may be cancerous. If this occurs, additional therapy may be required. Your pediatric surgeon will explain all of the aspects of SCT to you and your family.